What factors lead to Kernel’s impressive success? Cohesive management and financial support from a global investment company helped, but the key was betting it all on an original product. IT REQUIRES considerable courage to begin working for a newly established firm wanting to assert itself on the market with a completely new product. And putting several millions of your own crowns into the start-up requires, besides courage and those millions, a strong vision of the firm’s future. A group of managers led by Michal Šorm, Kernel’s current general director, dared to do both. Kernel, the producer of Live Tile glass tiles, has not let them down yet. True, doubling sales year-on-year since 1999 is nothing remarkable for a start-up, but for Kernel this means anticipated sales in real numbers in 2002 of CZK 80-100 million. This promising project even attracted a two million dollar investment from Genesis Capital, a local affiliation of Advent International investment company. So how did Michal Šorm, formerly the main shareholder and director of a group of comestibles companies (Emarko and Bask) with sales of nearly CZK 3 billion, get involved with glass tiles? “Together with other managers and shareholders, I sold the Emarko and Bask group to a Norwegian concern,” says Šorm. “I used money from the sale of the companies to start Kernel in 1999.” When these firms, which controlled 70% of the spice and so-called heavy groceries (rice, beans, etc.) market, were sold, one condition was that the former owners not engage in the comestibles business for the next five years. “So we started over with tiles, as glass is truly far removed from food,” Šorm recalls with a smile. 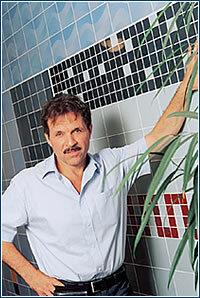 Glass tilingAccording to Kernel’s director, Michal Šorm, glass tiling is nothing new. “At the beginning of the twentieth century, glass tiles were far more commonly produced than they are today, but then they were displaced by cheaper ceramic tiles. But this has been forgotten, so today we have to overcome people’s lack of faith in this material,” Šorm says. The big news is how light is refracted when the tile is viewed from different angles. According to Šorm, this unique feature can pose problems in certain situations. For example, you can’t capture it in a photograph. “A classic catalog would be nearly useless for us; so we have to travel around the world and show people ourselves,” he says. Modern technologies make it possible to use glass in places where it was once impossible. “We temper the glass, so it can be used on facades and as flooring,” Štolbová says. “It’s more exclusive than ceramics. In our vestibule we have been using our tiles for over a year without any problems.” Glass can also be bent rather easily, so it’s no problem to make tiles for covering a round column for a specific order. Kernel exports 85% of its production. According to Olga Varadínková of the firm’s marketing department, Live Tile tiles have gained a foothold in the German, Austrian, French, and British markets. The newly built showroom in Prague’s Millenium Plaza should help support the products on the Czech market. Individual implementations can be seen all around the world. “The five-star Victoria Plaza hotel in London, a convention center in Morocco, an Olympic-sized swimming pool in Jakarta, the Babylon aquapark in Liberec, the vestibule of a theater in Japan, and a hospital in Singapore, where the hygienic properties of glass, as opposed to porous ceramics, are put to good use,” says Šorm, mentioning some projects. “I like starting firms from scratch. But I’ll be glad when everything is up and running. Traveling tires me out,” admits Šorm, who returned shortly prior to this interview from business trips to the US and Japan. He plans the firm’s consolidation for 2005, when he expects sales to reach the CZK 300 million mark. He is planning on continuing as an independent firm in the Czech Republic after that, but he won’t rule out selling production licenses for some regions around the world. “On advanced markets, where venture capital is well established, firms have experience with it. In this country there is often a lack of trust and understanding,” says Genesis Capital’s investment manager, Radim Jasek. The basic condition that Genesis Capital required the firm to adhere to is that it prepare a business plan that looks ahead five years. According to Jasek, many firms have no idea what such a plan should look like, that it must contain an estimate of the development of all basic parameters, such as costs, sales volumes, market share, and so on. 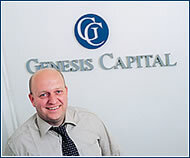 Genesis Capital invests in about one firm in a hundred that it reviews. Jasek recalls that Kernel was one such project. “We invested two million dollars as a convertible loan. It works like a classic debt with interest,” he says. “However, the interest is not paid, it remains in the firm. In 2005, when it comes due, we can request that it be converted into shares. If we did so immediately, we would acquire 17.5% of Kernel, but in 2005 we will get 35% after a second investment. We can demand that it be repaid directly at any time, but Kernel’s good development assures me that we won’t have to cash out,” says Jasek, explaining the entire transaction. Investments don’t always pay off. “Failure is a nightmare for us, of course,” Jasek admits. For example, in the unsuccessful Globopolis internet company project, his firm lost half a million dollars.